The Honda Odyssey 2012 body uses a tapered cabin design with a signature "lightning bolt" character line to create a dynamic and distinctive appearance. Additionally, the styling cue creates a relatively large third-row window that enhances the outward perspective for third-row passengers. Engineered for a quiet interior, the Odyssey's highly-rigid body with 59 percent high-strength steel (an exceptional amount by industry standards) helps enhance the effectiveness of the vehicle's sound-deadening material to isolate road noise. The high-strength steel also helps to reduce body weight for better fuel economy and optimize body rigidity for agile handling. 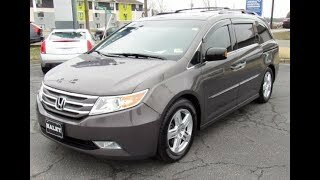 Completely redesigned for the 2011 model year, the 2012 Honda Odyssey remains the class-leading minivan for fuel economy and safety ratings, while continuing to offer the refinement, space and engaging driving experience that people have come to expect from this highly acclaimed family vehicle. Class-leading achievements include the highest EPA highway fuel economy rating for an eight-passenger minivan of 28 mpg for Odyssey Touring. 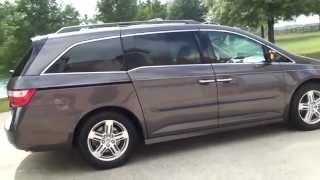 Plus, all Odyssey models achieve the best possible safety ratings from both the National Highway Traffic Safety Administration (NHTSA) with a 5-Star Overall Vehicle Score and the Insurance Institute for Highway Safety (IIHS) with a TOP SAFETY PICK, an achievement that no other currently-tested minivan can match. Designed and built1in the United States, the five available models consist of the Odyssey LX, EX, EX-L, Touring and Touring Elite, with each providing a unique combination of features, value, luxury and in-vehicle entertainment technology. Changes for 2012 include the addition of select features to the Odyssey EX that were previously exclusive to the Odyssey EX-L. For 2012, the Odyssey EX now includesBluetooth®HandsFreeLink®, the intelligent Multi-Information Display (i-MID) with an 8-inch TFT screen, a 2-GB CD Library and a USB Audio Interface. The 2012 Odyssey Touring receives an exclusive exterior color, White Diamond Pearl, replacing Taffeta White on the prior model. The Odyssey body uses a tapered cabin design with a signature "lightning bolt" character line to create a dynamic and distinctive appearance. Additionally, the styling cue creates a relatively large third-row window that enhances the outward perspective for third-row passengers. Engineered for a quiet interior, the Odyssey's highly-rigid body with 59 percent high-strength steel (an exceptional amount by industry standards) helps enhance the effectiveness of the vehicle's sound-deadening material to isolate road noise. The high-strength steel also helps to reduce body weight for better fuel economy and optimize body rigidity for agile handling. The interior offers multiple modes for accommodating child seats, adult passengers and cargo, along with offering a comprehensive range of in-vehicle entertainment technology. To fulfill its design goal to be the ultimate family vehicle, the interior provides three rows of comfort-oriented seating with generous sedan-like legroom in each row; along with providing up to five Lower Anchors and Tethers for CHildren (LATCH) positions for child seats (the Odyssey LX has four LATCH positions). The passenger volume measures 172.6 cu-ft. (Odyssey LX and EX) and the cargo volume ranges between 38.4 cu-ft. cargo volume (all seats up) to 148.5 cu-ft. depending on the seating configurations. A 4x8 sheet of plywood can fit inside the Odyssey's cargo bay with the second-row seats removed, and 10-foot-long 2x4 studs can fit inside the vehicle with the available front console removed. To help enhance driver comfort, especially on long trips, the driver's seat features 10-way power adjustable seating (8-way power adjustable on Odyssey LX). A "3-mode" second-row seat design provides the ability to attach up to three child seats across the second row (Odyssey EX and above) by relocating the outboard seats to alternate positions closer to the doors. The one-motion, 60/40 split third-row Magic Seat®, one of the Odyssey's original concepts and most versatile features, affords legroom for average size adults and is easy to open and close with one hand. Highlights of standard features on all models include air conditioning with manual front and rear controls, power driver's seat, power windows with auto-up/down driver's and front-passenger's windows, tilt and telescopic steering column, a maintenance minder system and more. Odyssey EX models and above come standard with power sliding rear doors, an "intelligent" Multi-Information Display (i-MID) with customizable wallpaper, center console storage, a flip-up trash bag ring, conversation mirror and more. Odyssey EX-L models include leather-trimmed seating surfaces (front and outboard second row), heated front seats, XM Radio®, power tailgate, a cool box, rearview camera and much more. Standard equipment on the Odyssey Touring includes the Honda Satellite-Linked Navigation System2, a Rear Entertainment System with a 9-inch display, driver's seat with two-position memory, 115 Volt power outlet, fog lights, parking sensors, six-speed automatic transmission and much more. The Odyssey Touring Elite adds an Ultra-Wide Rear Entertainment System (RES), blind-spot information system, High Intensity Discharge (HID) headlights and more. Technology features available on certain models include a Honda Satellite-Linked Navigation System2with Voice Recognition, which is available on the Odyssey EX-L and standard on the Odyssey Touring. The system features an 8-inch, high-resolution VGA color display and GPS technology to provide turn-by-turn guidance to a destination, in addition to other features including subscription-free FM Traffic data and aZagat®restaurant guide. Standard on the Odyssey Touring Elite is the state-of-the-art, factory-integrated Rear Entertainment System that includes an ultra-wide 16.2-inch flip-down LCD screen and a 12-speaker, 650-Watt sound system capable of reproducing Dolby® Digital 5.1 Surround Sound in 360-degree detail. A High-Definition Multimedia Interface (HDMI) video input and two wireless headphones for rear passengers are also provided. The Odyssey Touring Elite also includes the Blind Spot Information system (BSI), which helps alert the driver via indicators near the side mirrors when other vehicles are detected in set zones to the left and right of the Odyssey. An advanced 3.5-liter, 24-valve, SOHC, i-VTEC V-6 engine with Variable Cylinder Management (VCM) provides a balanced combination of performance, fuel economy and low emissions. The engine produces 248 hp (the most ever for Odyssey) and 250 lb-ft. of torque, while delivering an EPA-estimated city/highway/combined fuel economy2of 19/28/22 mpg on Odyssey Touring models (18/27/21 mpg on Odyssey LX, EX and EX-L models). A 5-speed automatic transmission is standard on Odyssey LX, EX and EX-L models. Odyssey Touring models feature a 6-speed automatic transmission for enhanced driving refinement. A 118.1-inch wheelbase, a fully independent suspension design and features such as Vehicle Stability Assist (VSA®) with traction control contribute to the Odyssey's confident driving performance and comfortable ride. The MacPherson strut front and multi-link rear suspension allows each wheel to maintain its own contact patch with the road, which is a significant benefit compared to less sophisticated torsion beam-style rear suspensions often used on other minivans. The Odyssey was recently named a TOP SAFETY PICK from IIHS, the institute's highest safety rating. The rating recognizes vehicles that do the best job of protecting vehicle occupants involved in front, side and rear crashes, plus rollover performance based on ratings in IIHS tests, as well as having a standard electronic stability control system. The Odyssey earned the highest-possible score of GOOD in all four ratings, including the rigorous roof-strength test. In addition to earning the TOP SAFETY PICK designation, the Odyssey was one of the first vehicles to achieve NHTSA's best-possible "Overall Vehicle Score" of 5 stars. The Odyssey achieved its top "Overall Vehicle Score" with 5-star ratings for the frontal crash safety test and both side crash safety tests4in all evaluated front and rear seating positions and scenarios. The Odyssey also received 4 stars for the rollover rating. An extensive list of safety equipment includes the Advanced Compatibility Engineering™ (ACE™) body structure, a Honda-exclusive body design that enhances occupant protection and crash compatibility in frontal collisions. Additional standard safety equipment includes: Vehicle Stability Assist™ (VSA®); anti-lock brakes with electronic brake distribution (EBD) and Brake Assist; three-row side-curtain airbags with a rollover sensor; driver's and front passenger's side airbags with passenger-side Occupant Position Detection System (OPDS); and dual-stage, multiple-threshold front airbags. 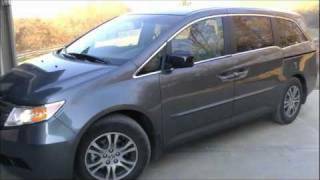 The 2012 Odyssey is truly an American-made vehicle that is designed, engineered and assembled in the United States1, and represents the expanding capabilities of Honda in North America. 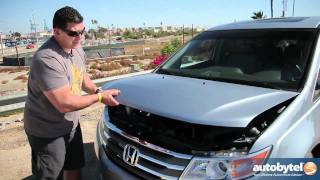 Virtually every aspect of the Odyssey was envisioned, developed, tested and finalized by Honda associates throughout California, Ohio and Alabama. The Odyssey is produced exclusively at Honda Manufacturing of Alabama (HMA) using domestic and globally sourced parts. The Lincoln, Alabama, plant conducts synchronous production of vehicles and engines and is the exclusive global producer of Odyssey minivans, Pilot SUVs and Ridgeline pickup trucks. Awards and accolades for the 2011 Odyssey include About.com "Readers Choice Award" for the best minivan, ALG "2011 Residual Value Award for Best Multi-Purpose Vehicle,"AutomobileMagazine "All-Star" award, Cars.com "Family Car of the Year," Edmunds.com "2011 Top Recommended(SM) vehicle" and "Best Retained Value Award" for a minivan, EdmundsInsideLine "Editor's Most Wanted(SM)" award for 2011, Kelley Blue Book "Top 10 Family Cars" for 2011 and "Best Redesigned Vehicle for 2011," and more.